Google has done a great job with web search for consumers, but what about enterprise search? Will Google Docs and Spreadsheets succeed in the enterprise? I don't think Google will succeed in the enterprise. Why? Customer Support. Have you ever tried to call Google Customer Support? Hmmm...have you ever tried to find the phone number? I can't find one. Have your ever tried to email someone in customer support? Good luck. Google's famous 24X0 support is all self service. Search for an answer in the Help database or submit a question to the discussion forum and hope someone else answers it. Google acquired FeedBurner, the RSS feed service. As you may have read in my previous post "Google Reader RSS feed messed up?" some of my readers are having problems reading my feed in Google Reader. I have searched for solutions to the problem and have tried to submit help requests. Very frustrating. Will enterprise customers put up with this? No way. Can Google fix their Customer Support problem? Yes, Customer Support isn't rocket science, but perhaps that is why Google doesn't value it. Google will need to change its attitudes and values to embrace customer support as an important service. Will they? They haven't yet. Take a look at these two examples of poor customer support. Feedburner Support? 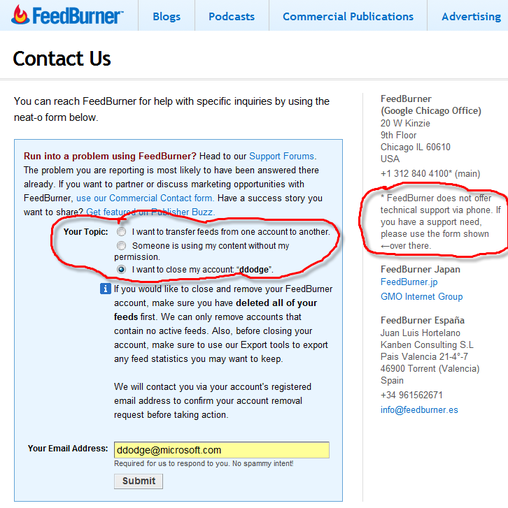 Here is what you are faced with if you need help on Feedburner. Note the "neat-o" help form, their words, not mine. Great if your problem fits into one of those three areas. If not?...good luck. OK, so they don't offer telephone support, and if you want to use their "neat-o" form...you have 3 choices; transfer your feed, complain that someone else is using your feed, or cancel your account. What do you do if you need help with a feed problem? Go to the discussion forum and hope someone else will help you. Agree that goog customer service is lacking but this is something they can scale up. Of course it is going to hit their margins. The quality of support varies quite a bit across high tech companies, and you get what you pay for. The free support from Microsoft whenever I have activation problems with Vista Business is terrible. Even with paid enterprise support, if you have a real problem, you often have to wade through first-level support to convince them that you already tried rebooting the system in question before you can talk to someone who can actually help. At the highest level, big corporations get good support because they pay millions for hardware/software and get dedicated support staff in their own offices. On the other hand, plenty of companies embrace self-service support and try to get customers in touch with each other to help solve problems in support forums. And if users don't get the support they want from the vendor, they'll get it from peers anyway on mailing lists, Usenet, and web forums. The access Google (and other search engines) gives you to search those archives is very valuable. Great post, Don. I had a similar Google experience a few months back, when the Google search engine suddenly removed my blog from their index. No way to contact a human being...by phone or e-mail. They have the same philosophy regarding sales reps. They believe the self service method is best. Audio adsense is failing because they removed the human element that dmarc once had. I think it is a stretch to blame companies for not providing phone support for services they offer for free. It applies to all of them, including Google, Yahoo! and Microsoft (try contacting them regarding your hotmail account). On the other side, support for paid services at Google (Google Aps for your domain) is exceptional. Really, I've used it multiple times. Not the case at Microsoft - I am sure you know. So it there is one to fail in the Enterprise services space (where services are not provided for free) because of poor support, I do not think it is Google. Is there a number I can call when MSN or Hotmail or Passport unexpectedly go down? Same thing applies to the GOOG. You are right about Google, but what you have failed to say is this: Microsoft are also failing at enterprise software too. Of course, I can understand why you can't be impartial here - but, lets face it, the software industry is dead - it's only the guys who turn the software IP and assets into a useful service will survive. It'll be a slow death for Microsoft and Google - dinosaur and trainee dinosaur vying for a non-market. Salesforce.com have an Enterprise 2.0 vision with an Enterprise 1.0 culture - so they're doomed too. The next generation of software-as-a-service will belong to the same owner as the World Wide Web - eg. no one. The IP will be a function of user experience design and architecture of participation - applied to mass markets and niche markets - the rest is a commodity. Software innovation is all about autonomic computing applied to the cloud - not fiddling with arguments about software and services versus software-as-a-service - just to prolong the Windows cash cow. Google Apps are a joke - Vista is an over-engineered, zero innovation outcome. The future belongs to business architects, not software dinosaurs - present or future. Ian, I think you have a different definition of success than I do. Microsoft is growing top line revenues by over $4 Billion a year. Probably $5B next year. This is more than all the Web 2.0 companies COMBINED, and will be for a very long time. Dying? I don't think so. I also think you are wrong about the future of the software business. It is not an all or nothing thing. There will be a blend of software and web based services and the mix will change over time. It will never be all one or the other, but a blend of the best of both worlds. I do agree that support for free services is a different matter than support for paid software and services. 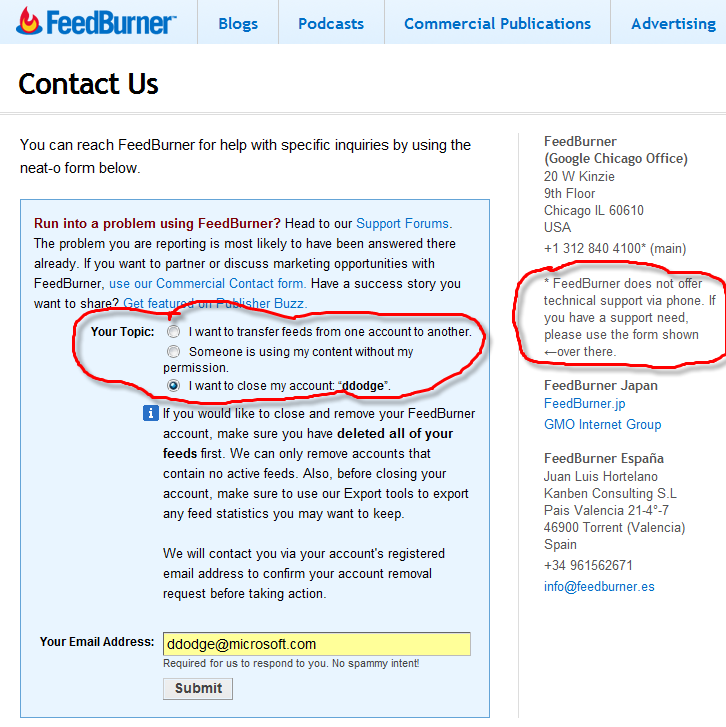 I used the example of Feedburner and Google Reader because I was just dealing with them, or at least trying to. That got me thinking about the larger picture of Google attempting to sell software to enterprises. They will have a hard time making the cultural shift from free web services with no support to paid software with professional support. but i am never able to find a Support person for Microsoft product too . they keep me on hold for hours and make me navigate 100 of menu option in IVR . unless you are Boeing or E&Y . getting support from a Big company like MS or Google is very rare . and i think most of the Ms-SQL Server user will agree with me . * Deployment make more headache than support. Windows Vista is good, but deploying it, learning how to use it are very hard and create more problem than it solves. your comments aren't based on facts. We (Google) provide 24/7 phone support to our enterprise customers, including both Google Search Appliance and Google Apps Premier Edition (the subscription version). Our enterprise support team is an amazing organization that gets better every quarter. I know cuz I run the division . . . .
Hi Dave, I was wondering how long it would take you to respond. Note to Readers: I have known Dave Giouard, VP & GM of Google Enterprise, for 10 years. I was at AltaVista and Dave was at Virage when we worked on a video search project. One other side note. Bradley Horowitz was the CTO and also worked on the project. Brad is now SVP of Strategy at Yahoo. Small world. On Customer Service, as I said, it isn't rocket science, and can be fixed/improved. The question is if Google has the desire and culture to do it and make the necessary investments. It is expensive and much harder than it looks. Can Google do it? Yes. Will they? I don't know. Dave says yes, and he is in charge of making it happen at Google. If they give him the budget and talent he needs...Dave will make it happen. I just don't get it. Why offer a service that will reasonably require attention to problems or concerns and fall short with customer service support?